Until Tuesday, the Central Valley School district hadn't passed a construction bond since 1998 (the year of the Monica Lewinsky scandal.) While ballots are still being tabulated, Central Valley's bond has a comfortable lead above the necessary 60 percent threshold at more than 64 percent. Its levy, which only requires 50 percent "yes" votes to pass, is doing even better, at about 68.6 percent. "We went out early to our community to inform them of what we were looking to accomplish," Small says. A year and half ago, Small estimates, the facilities committee started presenting initial plans to the community. Ten months ago, the major projects were outlined. Long before signs started going up and flyers — pro and con — started going out to voters, voters had heard the nitty-gritty details about the proposals. In previous years, Central Valley had held town halls to gather citizen feedback about their priorities for bonds and levies. This time, the district went beyond town halls, using software called Thoughtexchange to gather over 4,000 comments of initial feedback. It allowed them to identify what the community really cared about, and what it didn't. And that extended to discussing the levy with voters in person, too, even if they were just shopping for fresh produce. "I think I spent a month and a half of Saturdays at the Liberty Lake farmers' market" last summer, Small says. Central Valley has a big overcrowding problem, with the number of students outstripping the classroom space. And Central Valley hit that home, laying out bar graphs in mailers explaining how the district was already over capacity, and the problem was going to get worse. Obviously, not every district faces the same problem. 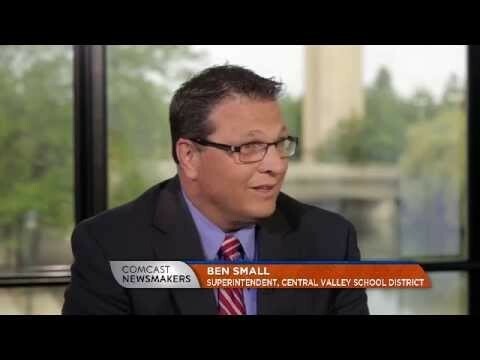 Central Valley's neighbor, the East Valley School District, suffers the opposite problem, with declining enrollment sapping away per-student state funding. If East Valley tries to run a bond next year (they haven't passed one since 1996) it will have to develop its own unique argument. "The advice I would give anybody is that voting is an individual act," Small says. "And every community has individual traits. You have to look at community needs, and respond to the community need." When Inlander readers began debating the Central Valley School Bond on Facebook, Downtown Spokane Partnership president Mark Richard joined the fray, sporting a pro-bond/levy avatar. "Our districts are not perfect," he wrote after decrying what he saw as misleading propaganda from the anti-bond group. "But our kids' futures are priceless. If you no longer have school kids, think of how the community supported yours. If you have never had kids, think of your tax dollars that will go to jails, free medical care and social services if we don't support education. VOTE YES." "Education is the foundation of innovation & entrepreneurship, which make a city thrive. #supportthefuture #downtownspokane," the DSP Twitter account tweeted. "Mark is someone I’ve consulted and talked with," Small says. "I see Mark as a community leader. We engaged with a lot of conversations with our community leaders." More than that, former DSP president Marty Dickinson led Central Valley's pro-bond and levy campaign. "Well, I’ve got to tell you, the grassroots groundswell of support we have is amazing," Dickinson told the Inlander before the election. Next time Central Valley runs a bond, however, not raising taxes may be trickier. They're looking at the possibility of building a new high school to meet their growing student population. "We’re going to make every effort to live within the tax rate we have set," Small says. "We want to continue to live within that tax rate."